M is for multiroom…and magnificent. Designed by legendary Danish audio brand Bang & Olufsen, this Wifi-connected speaker is made to fill a room —or your whole house—with high-quality sound. It connects wirelessly through services like Spotify Connect, Google Chromecast built-in, Bluetooth Audio Streaming, or Apple AirPlay and offers integrated, intuitive controls: Just press or turn the top disk to control playback and volume. The sleek, cylindrical design (6.5″ x 7″) ensures the M5 looks as good as it sounds, harmonizing with any decor. 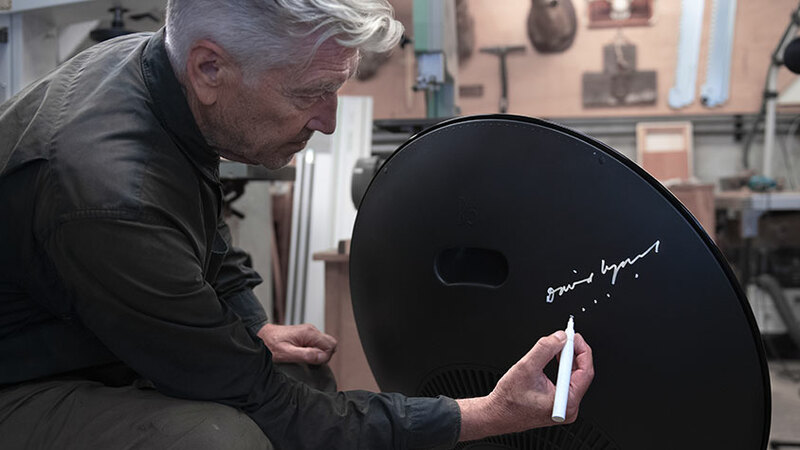 This speaker features special edition packaging and cover with artwork by David Lynch, with his signature laser engraved on the top of M5. Bang & Olufsen was featured in MoMA’s 1978 exhibition Bang & Olufsen: Design for Sound by Jakob Jensen. • Personalize your music experience using the ToneTouch feature in the Bang & Olufsen companion app. • 1 woofer, 1 midrange, and 3 tweeters. • Wifi streaming or Bluetooth 4.0 connectivity. • True360 Bang & Olufsen Signature Sound.